Gibson L-0 1939 | SOLD | Through its run of about a dozen years the L-0/L-00 was offered a various times in both sunburst and black. This example dates to 1939 based on the FON stamped on the back of the headstock, and is resplendent in black lacquer finish with a contrasting 'fire stripe' pick guard. The top is spruce, the back and sides mahogany, with both the top and back bound in white celluloid. The neck is mahogany, with a comfortable 'soft' V carve, topped with a Brazilian rosewood fingerboard. The black-painted head stock sports the iconic 'Gibson' logo in white script. The original bridge is Brazilian rosewood. Tuners are the original Kluson with the coveted amber buttons. The top measures 14 3/4" across at the lower bout, and scale length is ~ 25". The neck measures a hair over 1 3/4" at the nut. The guitar is complete and original with the exception of some bridge pins and possibly the end pin. 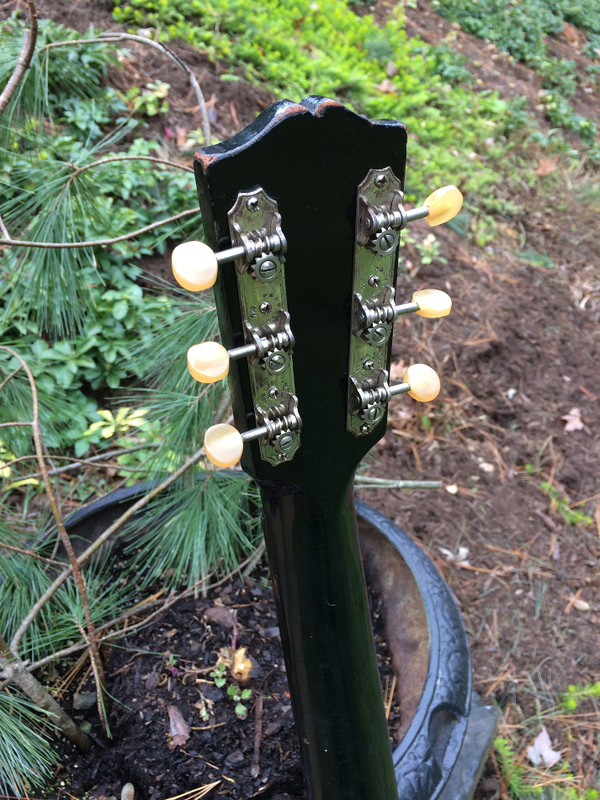 Repairs include a recent neck set and bridge re-glue, and the frets were leveled and dressed. There is a older top crack repair. Additionally, in the past, it appears that someone had lightly over sprayed the top. The back shows a bit of 'strap blister' in spots, with typical and various nicks and dings from use and wear. Overall, a really nice example, in solid condition, priced for the player who wants a great finger picking or old-time guitar. The guitar plays well and is a fine sounding example of one of Gibsons more popular models. Comes with an older hard case in good condition. Be sure to check the sound clip!